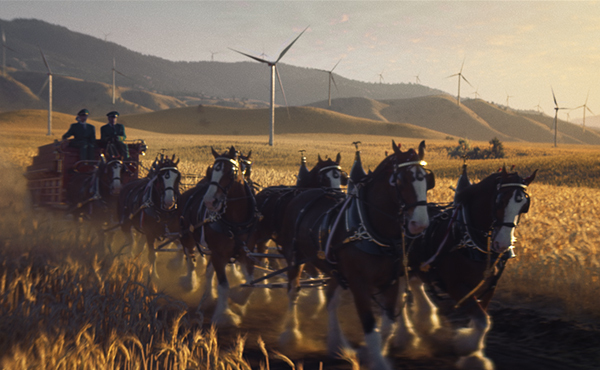 It is nothing new for a business to use clean energy credentials to burnish its image, but nobody has done it quite the way Anheuser-Busch InBev did during Sunday’s Super Bowl broadcast. It was a fitting coda for a year when corporate clean energy purchases shattered records. Here’s what happened and what may be next. I’m Dan Gearino, providing you with the latest about the clean energy economy. Send me news tips and comments at dan.gearino@insideclimatenews.org. Thanks for reading! The maker of Budweiser beer chose a high-profile stage to tell the world it buys renewable energy to offset its electricity use. Kevin Haley, manager for the Business Renewables Center (BRC) at the Rocky Mountain Institute, says this is the highest profile example he’s seen of a company telling the world about its renewable energy buying. It’s also expensive. A 30-second ad cost about $5 million. U.S. companies set a new record for renewable energy purchases in 2018, blowing away the previous mark. Much of it was by companies that, like AB InBev, are members of RE100 and have committed to go to 100 percent renewable energy. By BRC’s accounting, 76 U.S. companies announced renewable energy deals last year totaling 6.53 gigawatts of generating capacity. That’s up from 2.78 GW announced in 2017, and more than double the prior record of 3.22 GW in 2015. A few big buyers helped tip the scales: More than a quarter of that capacity was purchased by Facebook, followed by AT&T, Walmart, ExxonMobil and Microsoft. Businesses are making these deals because of a desire for predictable electricity prices that help to meet internal goals for carbon reduction and sustainability, along with benefits for a company’s public image. BloombergNEF, which tracks worldwide corporate clean energy purchases, says 2018 also set a global record. Power purchase agreements totaled 13.4 gigawatts globally, up from 6.1 GW the prior year, which was the previous record. A brief aside about what these deals do, and do not, entail: Most corporate renewables contracts are known as virtual power purchase agreements. The virtual part means that the wind or solar plant is not sending electricity directly to the buyer. Instead, the plant sells the electricity into its local wholesale market at the market price. The agreement leads to the creation of renewable energy that offsets the electricity a company purchases from its local grid to meet its needs, under financial terms agreed to by the seller and buyer. The big exception to this is rooftop solar and other on-site renewables, which directly power the operations of their users and are a big part of the mix for some companies. So, was the Budweiser ad successful? Early indications are that it got lots of attention, which is the whole point. 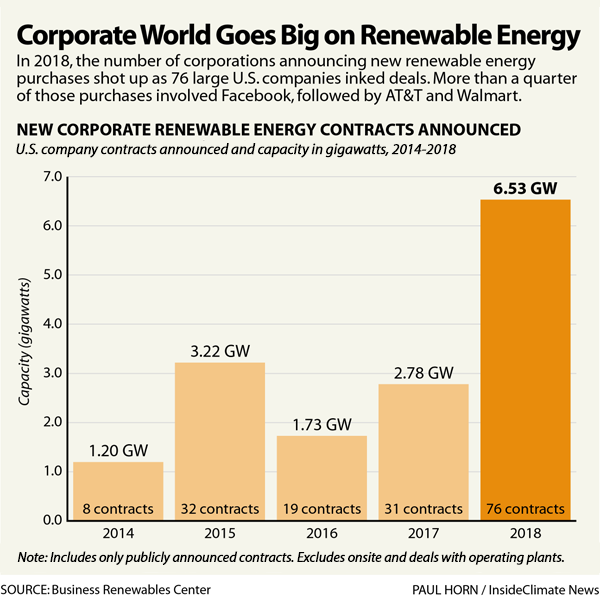 Can Corporate Renewables Keep Up the Pace in ’19? U.S. companies could have a great year for renewable energy purchases in 2019 and still fall short of the 2018 record. One reason is that there is no precedent for the scale of Facebook’s purchases last year, and it is not clear if any company will step up to play that kind of role this year. Facebook signed contracts for more than 2 gigawatts of renewable energy worldwide last year. Kyle Harrison, an analyst for BloombergNEF, told me, “It’s not impossible, but it’s going to be difficult” for the U.S. have another record-setter this year. Chances may be better that the world will set a new record in 2019 because of growth outside of the United States, while purchases in the U.S. would be flat or slightly down. BloombergNEF does not have an official forecast for corporate renewables, so Harrison was speaking about market trends rather than numbers. One factor helping the U.S. market this year is that companies want to sign deals ahead of the phaseout of federal tax credits. This is one reason that Higgins does not anticipate the kind of drop-off that happened after the last big surge, in 2015. 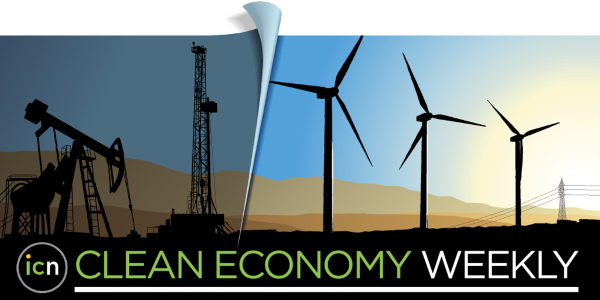 The larger point for the clean energy economy is that companies are driving demand for wind and solar to an extent that is moving the market at a level that rivals the purchases tied to government policies. And, as BloombergNEF has tracked, companies have a long way to go to meet their targets, which means there is substantial room for growth in corporate renewables over the next decade. 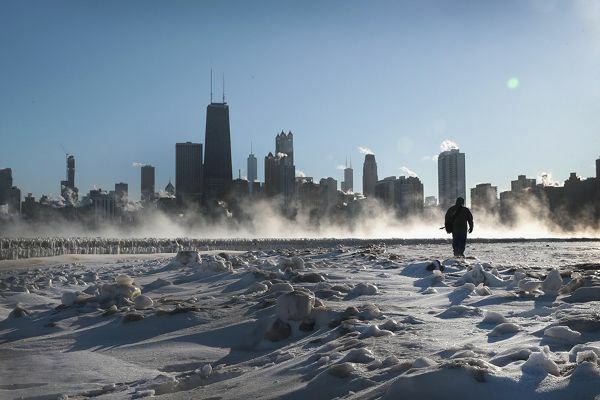 I wrote last week for ICN about about how Midwestern utilities and grid operators were able to keep their systems running with no major interruptions as a wave of sub-zero weather rolled through the region. A good sign of this success is that there has been little talk this week by coal and nuclear advocates about the grid’s performance showing a need to subsidize their resources. If the system had come close to failing, those calls likely would have been deafening. The utilities and grid operators say they learned from the 2014 polar vortex, a cold snap in which demand for power nearly exceeded supply. Events in 2014 were a key part of the lobbying message from coal and nuclear plant owners, as well. One footnote to last week’s severe weather was that wind farms underperformed, due to low winds and some cases of icing on equipment, according to an official with PJM Interconnection, operator of the grid that runs from Illinois to New Jersey. And now, a footnote to that footnote: PJM has very few wind farms, adding up to less than 1 percent of system capacity. Wind energy is a larger part of the mix in the grid regions to the south and west. The upshot is that there isn’t enough wind energy in PJM to draw broad conclusions from this one weather event about wind farms' resilience when temperatures plunge. An update on one utility’s energy transition: NIPSCO in northwest Indiana said on Friday that it will ask regulators to approve a contract for 800 megawatts of wind energy from three planned wind farms. The company has proposed a plan, which I wrote about last month, to close all of its coal-fired power plants by 2028 and make up for the loss of those resources by building renewable energy and buying additional power on the wholesale market. The largest of the three projects is 400 megawatts and located in Benton and Warren counties, a part of the state near the border with Illinois that has some of the strongest winds. The developer is NextEra Energy Resources, a Florida company that has become a nationwide leader in renewables, as I reported last week. The three wind farms would be up and running by 2020. That cost-savings is the main reason for the company’s decision to move away from coal, and it underscores the economics that I expect will lead to similar decisions by other utilities. Copyright Â© 2019 InsideClimate News, All rights reserved.